All K-Tech front fork springs are direct replacements for the original springs, and do not require spacers or modification for installation. 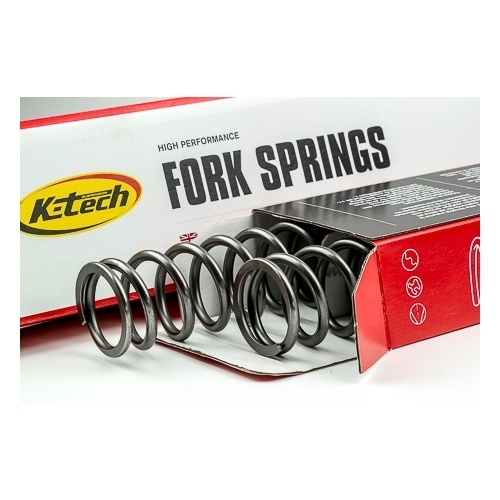 K-Tech front fork springs are produced from superior grade silicone chrome wire, which is specially treated and handled for precision and longevity. Springs are cold coiled, heat treated, tempered, shot peened, preset, and ground at both ends for ultimate performance. The outer diameter of the springs are polished for smoother, more consistent action. Spring rates are marked on the ends for easy verification and rate checked to within 2% and +/- 3mm overall length accuracy . If you seek improved handling from your machine, K-Tech front fork springs will help you dial in the correct sag for your specific machine and weight. Available in a selection of rates to suit your specific requirements.